: Are We There Yet? US, 2005, 95 minutes, Colour. Ice Cube, Nia Long, Jay Mohr, M.C. Gainey, Aleisha Allen, Philip Daniel Bolden. This is the question that occurred to me numerous times while watching this film. It has to end sometime, the sooner the better. It is one of those American ‘family’ films that glorify the most obnoxious and precocious children who could lead one into temptation of murder! And, what is worse, after being spoilt and mischievous, they are going to be wringing our hearts for sympathy before the end. Ice Cube, once a tough gangster-rapper type is now turning into Bill Cosby. When he agrees to take the children of a friend by plane (they mess that up), by train (they make him miss it) and then in his new, expensive car which is progressively demolished during the trip, you know you are in for the long haul. His forbearance is nothing short of miraculous. If you like cheeky kids wreaking mischief on adults with slapstick humour and tears at the end… so be it! 1. The intended audience? Younger audience? Adults, parents? The black audience? White audience? Worldwide? 2. The success of the comedy, the slapstick, the tangles between children and adults, precocious and demanding children and their interference? Adults having to cope? 3. The title? The exasperation during the trip by the children, by Nick? 4. The Oregon settings, the town, the highway between Oregon and Vancouver? The affluent settings in Vancouver, the restaurant, the streets? The musical score and songs? 5. 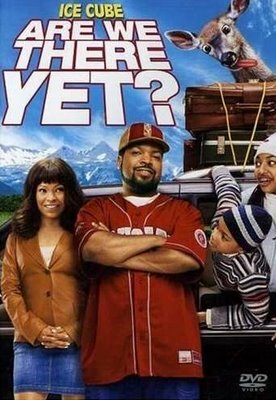 Nick, Ice Cube in a comic role? His stances, the sports store, not liking children? The encounter with Suzanne, the attraction? Her divorced status, her two children? His giving her a lift after the car broke down? His driving her to work? His falling in love, her resisting the kiss? His promise to take the children to Vancouver? The attempt to airport and its being thwarted, at the railway station? His friendship with his partner and the warnings? The car, the gradual destruction of the car? The incidents along the way, the cantankerous children, his coping? The phone calls to Suzanne? The clash with the trucker and the police? The crashes? The help, gradually arriving in Vancouver? His exasperation? 6. Suzanne, divorced, love for her children, spoiling them? Her going to Vancouver, relying on Nick – the relationship, resisting him, falling in love, exasperation when he arrived, his going out of his way to make the reconciliation, the children persuading her that there was a future? 7. The children, age, precocious, the initial sequences in thwarting the suitor, the “home alone” style? Their personalities, dangerous? Their resistance to Nick, the various devices in the train, the airport, in the car? The restaurant? The crashes? Their leaving, his finding them? Their wanting to see their father – and the pathos of looking through the window and seeing him with his new wife and family? Their change of heart, reconciliation with Nick, supporting him in all the problems in Vancouver? 8. The truckie, the clash, his interfering, the police, the chase in Vancouver, the reconciliation and his support? 9. The humour (or not) of the children’s pranks, the penknife at the airport, getting off the train, the gas station and locking him out, driving it into the sign, signalling to the truck driver about their kidnap, the crash, the freight train, the change of heart when they support him? 10. Popular American comedy – but what appeal?